Ack! The Yellow Menace. Fortunately we're not going through that yet. It usually hits here in late March and sometimes a little later right when Masters patrons come to town for the tournament. 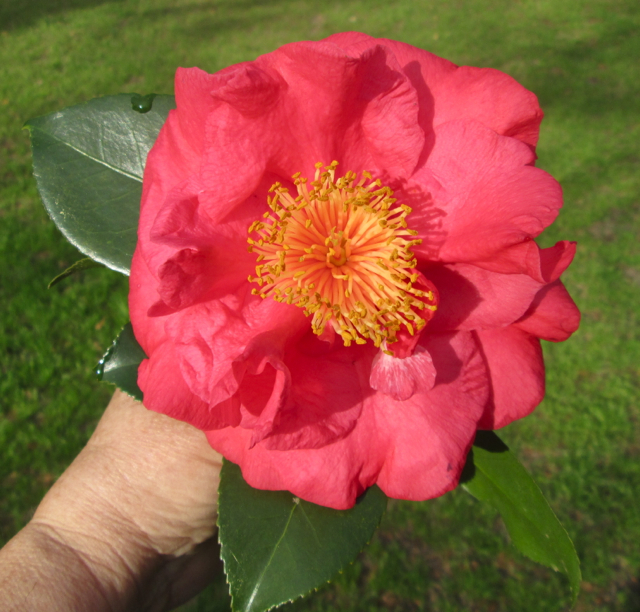 Pretty now ... azaleas are opening, camellias still blooming, deciduous magnolias full tilt. Roses putting out spring growth, patio containers freshened up. What kind of roses? Containers looking good...where did you purchase them? They look like something I could use instead of having many small pots. These are David Austin roses Lady of Shallot and Jude the Obscure. Mr. Austin just passed a few months ago but had spent 30+years breeding fantastic roses - give them a google. This year I decided to plant the big galvanized tubs with roses that will stay put. Previously I rotation planted veggies and flowers in them. I got the 2 big troughs at our local ag supply and the smaller one at an antique market. You just have to drill a bunch of holes in the bottom before planting. Meet 'Frank Houser', a semi-double reticulata Camellia. This one's 5" across with a 1" tall crown of stamens. A lot of the blooms got fried last week when we had two nights of 28 but the buds weren't affected so there are more blooms again. Plain Jane, I really like all your galvanized steel containers. Wow! What a fantastic Camellia! They are all over the neighborhood... just love them! That camellia is screaming "Look at me!" I’m a complete sucker for galvanized containers, lol. They are great for big plantings. You just have to make sure to drill lots of drainage holes and watch the watering. Being metal they will heat up a bit. Here’s a previous planting scheme before the roses. A couple of things at my place, look at that beautiful Texas sky. You Texas people, no fair, lol! Just sayin.